First, I’m doing a crafting update, but there will be some politics below that. 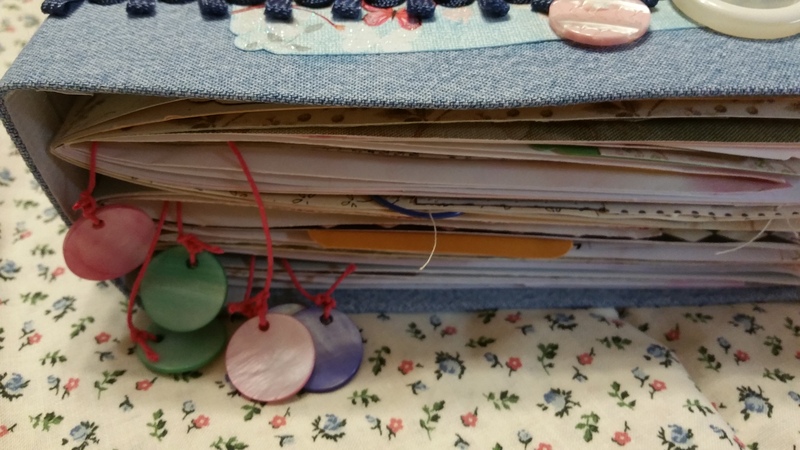 Another junk journal made with junk from my sewing room and a cereal box. The denim is from old jeans, which I have cut up into pieces over the years, intending to make “something” with those pieces. 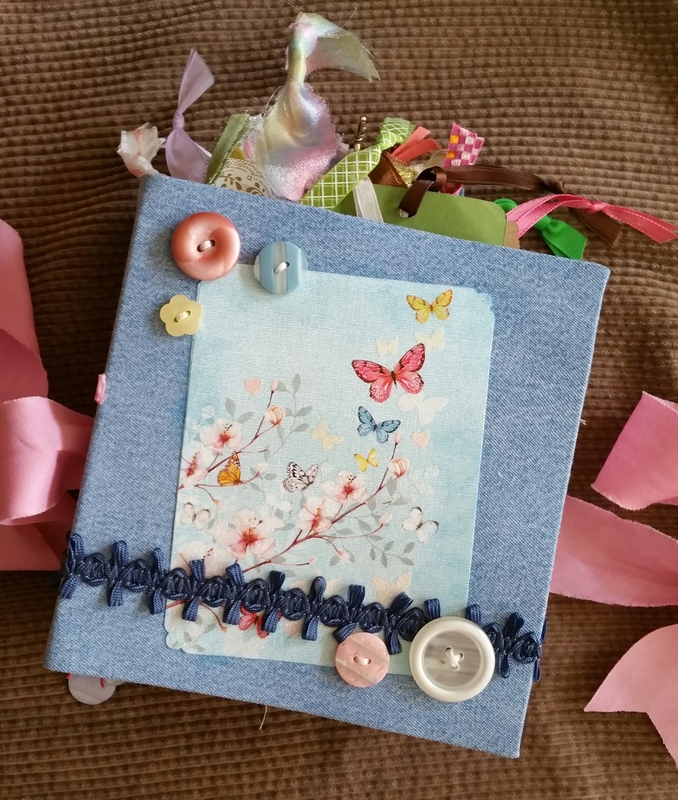 The picture is the front of a blank note card, and the trim and buttons were odds and ends sewing stuff. 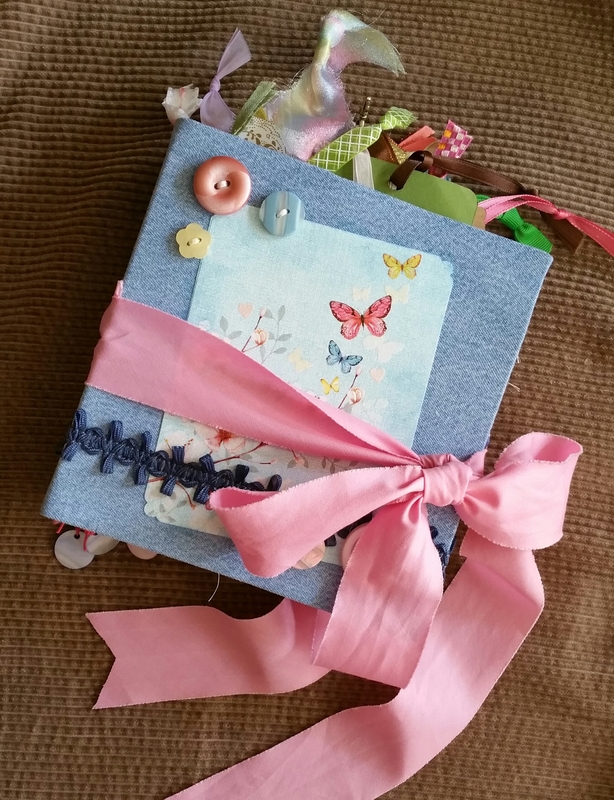 I had put a thin pink velvet ribbon on this journal, as you can see in the spine view. I didn’t like it, but I had glued it onto the spine. 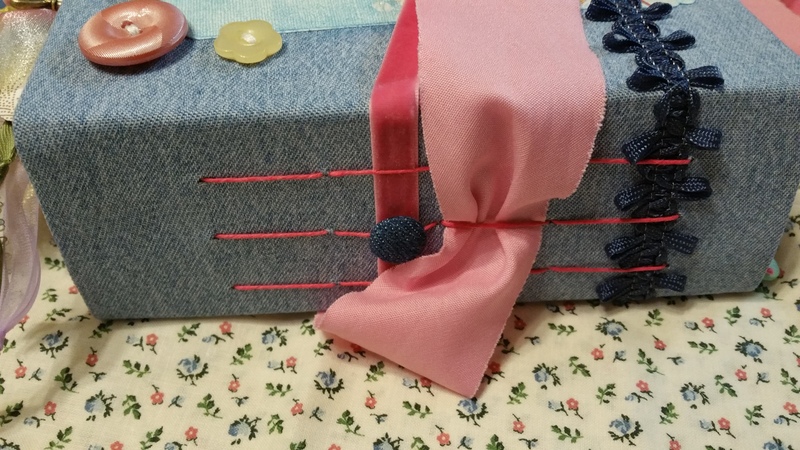 I added the pink seam binding ribbon, but I decided to cut off the velvet ribbon this morning, as you can see in the front view photos. That thin ribbon was annoying to deal with, but these junk journals become thick as you add stuff to them and a ribbon closure is useful. This was made using part of a Special K value size cereal box for the cover, so the spine is 2 and 1/4 inches thick and I sewed three signatures into this journal, with 10 sheets of paper per signature (each sheet is a two-page spread, 4 pages, front and back). I don’t think junk journals are practical for me to “journal” in, but they are fun to decorate and sort of addicting to make. I like simple lined paper to write on. I have no idea what I’m going to use this one for, but I had cut pages for the first junk journal from 12 inch X 12 inch scrapbook paper and I had the other half of all that paper sitting here. I decided to make another junk journal to use that paper. This scrapbook paper has been sitting in my sewing room for over a decade, from when I thought I really wanted to take up scrapbooking as a hobby… circa early 2000s. I have some finished scrapbook pages, but exactly ZERO completed scrapbooks. On the bright side, I do have a nice collection of scrapbook paper, tools and a lot of rubber stamps. 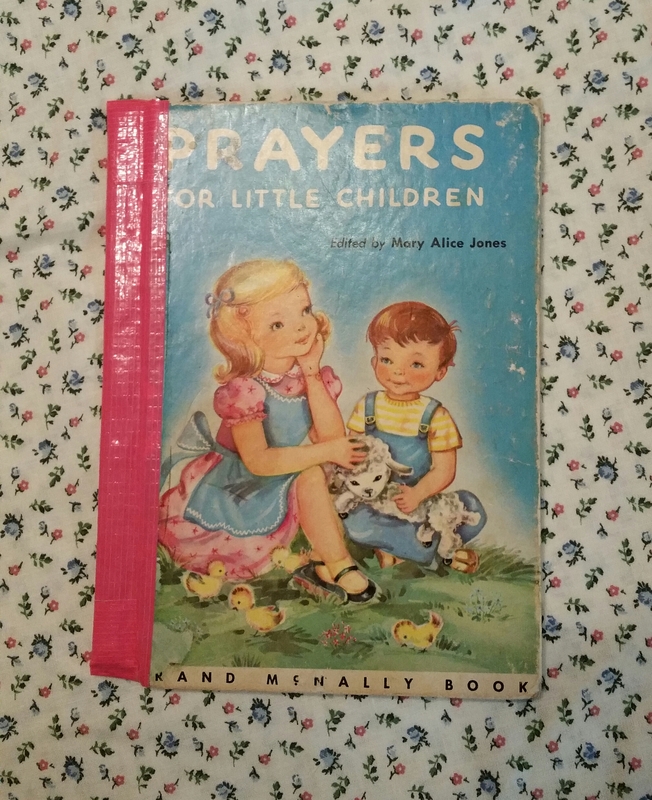 I also repaired my little prayer book. It’s not a professional job, but I stitched the pages together using quilting thread, which is strong thread and a tapestry needle. I used cardstock paper to glue the covers and signature together, then I used pink duct tape to cover the outside spine area. I probably should have used cardstock on the outside, to make a spine, before taping, so that’s a lesson learned, if I ever have to repair another children’s book. My wrist is acting up with carpal tunnel pain, so other stitching is on hold for now. President Trump scored a big win at the UN today, with a U.S. drafted resolution, imposing tougher sanctions on North Korea. The resolution was passed unanimously by the UN Security Council over the weekend. Without fail, President Trump drowned out that message with his petty tweets. He’s been going strong this morning with ad hominem attacks onTwitter. For those who hoped General Kelly would be able to rein in Trump’s erratic tweeting, well, forget about it. The rest of this post, is my last time repeating that President Trump is using the same information warfare strategy and tactics, which the Clintons introduced into American presidential politics, with their “war room”, in 1992, which culminated in their “scorched earth” campaign in 1998. Trump’s “GOP Insurgency” is the same information warfare strategy and tactics. After this post, I hope to write about topics other than Trump and his trashy Reality Show presidency. My political predictions have been totally wrong about Donald J. Trump. I did not think he could defeat the Clinton spin machine, with their lock on most of the mainstream media. Trump is like a repeat of the Clinton years, with their endless scandals and outrageous spin cycles. Then there was the impeachment debacle in 1998. I expected President Clinton to do the honorable thing and resign, to preserve the dignity of the Office of the President. Instead, he, with his wife leading the scorched earth effort, waged a vicious smear campaign on, not only Ken Starr, the independent prosecutor, but also on the truth. President Trump, like his former golfing buddy, Bill Clinton, will do or say anything to “win”. As I’ve repeated often, he even borrowed the Clinton’s information warfare strategy and he lies more than the Clintons, which is quite a feat. My prediction is that just like with Bill Clinton, this scandal is heading toward impeachment, but I expect Trump will go one step further than Bill Clinton, by trying to incite his followers, to protest and “fight back”. This has already started, with Trump reverting back to his rallies to stir up his followers and a couple days ago, loon, Mike Savage, was spewing that if Trump is taken down, that would be the start of a civil war. Sean Hannity rails on nightly about the nefarious “Deep State”, fueling distrust of US intelligence agencies and the FBI. This is the same thuggish, violent propaganda, the Trump campaign and sycophants used to threaten violence at the GOP convention, if Trump was not the GOP candidate. The Trump tough talkers love to use intimidation tactics even more than the Clinton sewer rats, like Carville and Begala. Republicans were too weak-kneed to stand up to Trump and his loudmouth, big name supporters during the primary, so it’s questionable how many of them will stand up to him if this investigation leads to impeachment proceedings. The Trump loyalists, who used to be staunch, moralistic conservatives, confuse me a great deal when it comes to Mueller’s investigation. I don’t understand why so many of them are willing to sacrifice all their integrity to prop up President Trump, who is a shameless liar. Just like with the Clintons, I supported investigating them, because there were so many smoke signals, spelling out corruption. Trump’s smoke signals are flashing neon lights. After his son stated that he walked into that meeting with the Russian lawyer in 2016, expecting to receive damaging information about Hillary Clinton from the Russian government, it should be obvious that Trump & team were willing to do anything to win. His son’s admission, on national TV, clearly shows they were open to Russian collusion and expected to receive damaging intel from the Russian government. Every American should want to know if their president has been in bed with Russian organized crime or has had financial dealings with them. If he’s compromised due to shady business dealings; we should know that. If he’s a crook; we should know that. It’s blatantly obvious he is a shameless, chronic liar. His whining about a “witch hunt” is as pathetic as Hillary’s years of playing the victim of a “vast, right-wing conspiracy”. Justice would be having the public corruption of the Obama administration, the Clintons and President Trump completely exposed, so that America could purge itself of them, once and for all. It might be cathartic for America to have American leaders get back to protecting and defending The Constitution and our civic values again. It’s going to be a long messy process, whether Trump’s presidency survives this investigation or not. It’s a safe bet, America’s never ending scorched earth information war will blaze on. We probably all need to take up other hobbies to get breaks from the political high drama. I’ll be making more “junk journals”, which are a good deal classier than listening to Trump’s trash talk.